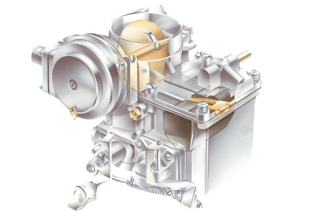 The Stromberg CD carburettor, like the SU (See Adjusting an SU carburettor), is a constant-depression carburettor, hence the CD. The two work in much the same way, but the Stromberg differs in having an air valve - commonly called the piston - surrounded by a rubber diaphragm in the dashpot. Later types with emission control have the letter E, as in CDSE and CD2SE. Tuning methods vary according to type, but Strombergs are not stamped with their type marks. Before starting to tune the carburettor, check out all the other systems such as sparkplugs, contact-breaker gap and the ignition timing (See How to drain engine oil and remove filter). Check, too, that the damper tube is topped up with oil to within 1 in. (6 mm) of the end of the rod. Use ordinary multigrade engine oil or the special SAE 20 oil made for the purpose by Zenith (the makers of Stromberg carburettors). Tune with the engine running at working temperature. If there is no pin, lift the piston with a screwdriver. Switch off the engine before adjusting the mixture, and check that the jet needle is central. Remove the air cleaner, lift the piston and let it fall. If the jet is central, the piston falls with a sharp click. 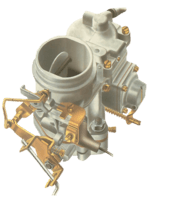 Screw the jet upwards (that is, anticlockwise looking down on the carburettor) to weaken the mixture, or down (clockwise) to make it richer. If tuning fails to make the engine run properly, the carburettor may need cleaning (See Air filter change), or the air filter renewing.